What did the 14th Century Dominican, Meister Eckhart teach about spiritual and contemplative practices? Not a lot. Better known, perhaps, for the challenging abstractions of his so-called mystical theology than for any substantive advice on practice it is hardly surprising that Eckhart’s methodology has often been called a ‘way without a way’. His typical response to requests for a contemplative method, such as those prescribed by other spiritual writers, was that the ‘way’ one uses is not particularly important, and can even be a hindrance. By identifying too strongly with a particular methodology one might end up ‘getting the way’ but miss God! Eckhart’s teaching was more concerned with cultivating a fundamental outlook or orientation to life than with promoting a particular ‘way’ or practice. A person who is rightly oriented will realize her or his ‘union’ with the divine not through some special spiritual practice but within the whole of life. German scholar, Dietmar Mieth, has called this approach a ‘mysticism of everyday life,’ which I think is a better characterization of Eckhart’s teaching than the ‘way without a way.’ For Eckhart a life of contemplation is not only entirely compatible with the hustle and bustle of ordinary daily life; in fact, the two – the vita contemplativa and the vita activa – mutually nourish one another. The highest contemplation is expressed in active engagement with daily life and work, not in spite of it. In Eckhart, the inner and the outer are integrated. Two texts within Eckhart’s quite extensive body of work that illustrate this aspect of his teaching are sermons on the same Biblical text, the story of Mary and Martha in Luke 10:38–42. A favourite among contemplative writers from the time of Origen in the third century this story of the two sisters of Bethany is given a fresh twist in Eckhart’s German Sermons 2 and 86, where his creative way of reading scripture is given a particularly good workout. While the traditional interpretation, and that adopted by most spiritual writers, would see the story as favouring the contemplative Mary over the active Martha, Eckhart turns it around completely. For him it is Martha whom Jesus holds up as exemplar of the truly grounded soul. To appreciate how and why Eckhart reaches this conclusion we need first to fill in a little background. We shall first take a moment to reacquaint ourselves with Luke 10 itself. Then we shall briefly survey the treatment given this same story by other writers in the contemplative tradition. This will give Eckhart’s approach some context. Finally, before examining Eckhart’s treatment of Luke 10 in some detail, we will give a few minutes to reacquainting ourselves with some key features of his mystical theology. The story of Mary and Martha in Luke 10:38–42. Let’s first look at the text, in the Latin from which Eckhart preached and then in a good recent English translation, the NRSV. If you have a Bible, look at the text in its context. You will notice that Luke has the Martha and Mary story grouped with the parable of the Good Samaritan, which precedes it (Lk 10:25–37), and the Lord’s Prayer, which immediately follows (Lk 11:1–4). 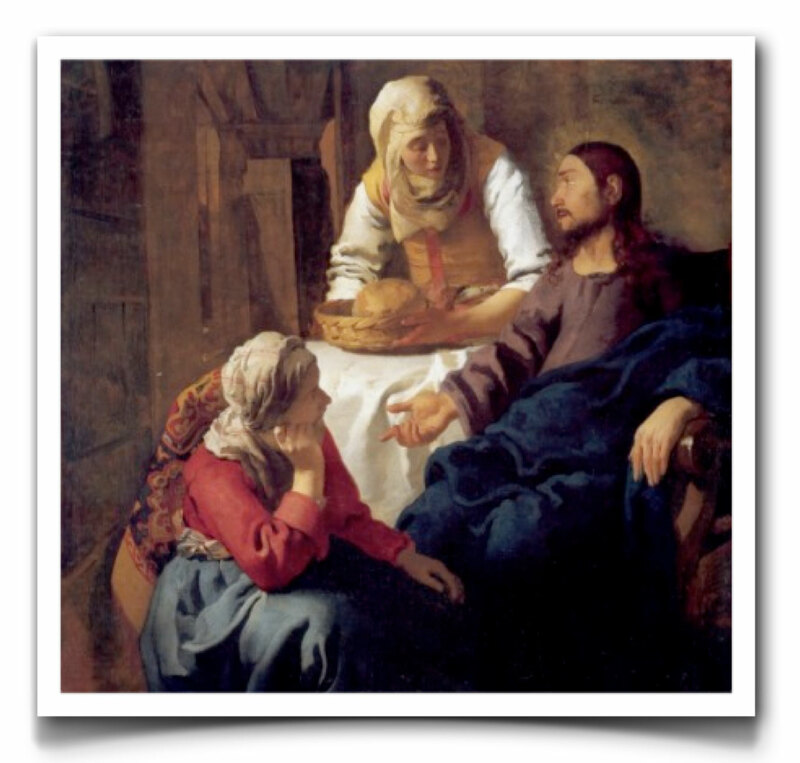 Between Jesus’ story of loving service and his instruction on prayer is a story of two sisters, one distracted by housework and hospitality and the other in rapt attention at the feet of Jesus. I think this is quite significant. This is a simple story. Two sisters are presented as opposites. Jesus indicates a preference for the approach of one over the other. The reader is left to conclude that she or he should follow the example of the sister that Jesus favoured. The story actually has the shape and structure of an example parable, except that its message is implied rather than explained. Down through the millennia this story, interpreted in this way, has been a favourite among writers in the contemplative tradition. Origen (184/5 – 253/4) was the first to see in Luke’s Bethany narrative an allegory of the classic Aristotelian dichotomy between the ‘practical’ and the ‘theoretical’. Martha epitomized the practical or active life, and Mary the theoretical or contemplative. For Origen the two lifestyles are not mutually exclusive but rather stages on the journey to Christian perfection. Spiritual maturity involves transcending the inclination toward temporal things and aligning oneself increasingly with the eternal reality that is our ultimate destination. Mary, exemplar of the contemplative life, is thus farther along on the path to perfection than her sister. John Chrysostom (ca. 349 – 407) rejected Origen’s allegorical interpretation altogether. For him the critical point of the story is not the preference of the contemplative over the active but how attuned one is to what is most important in any given moment. Martha was reproved not for being practical but for being caught up with other things when Jesus was in the house declaring the good news of the arrival of the Kingdom. Mary got it right, not because she chose the contemplative option, but because she dropped everything and gave attention to Jesus’ teaching at the time (kairos). Augustine’s (354 – 430) thinking bears the imprint of Greek philosophy, and in particular Neoplatonism. Accordingly, in his treatment of Mary and Martha we could expect action to be subordinated to contemplation. However, Augustine’s sermons reveal a rather more balanced view in which both sisters served the Lord admirably, although in different ways. The sisters were ‘siblings in the flesh but also in religious observance; both cling to the Lord; both served the Lord present in the flesh harmoniously,’ (Sermon 103). Martha’s waiting on the Lord in hospitable service complemented Mary’s waiting on the Lord in contemplative silence. Martha’s contribution was necessary and enabled Mary’s enjoyment of the Lord’s teaching. ‘Martha has to set sail in order that Mary can remain quietly in port,’ (Sermon 104). Although this is no longer the case, throughout much of the medieval period Luke 10:38–42 was the Gospel reading for the Feast of the Assumption (August 15). The linking of Martha and Mary with Mary the Mother of our Lord proved to be fertile ground for preachers seeking to bring out the spiritual sense of the text. When the renowned Cistercian, Bernard of Clairvaux (1090 – 1153), preached on this feast day he developed a rich and complex allegory to convey his notion of the ideal of the ‘mixed life’, wherein action and contemplation are united in Mary, the virgin mother. In Bernard’s allegory the home of Mary and Martha is likened to Mary’s womb. Each sister has a part to play: Martha, the pragmatic and active elder sister has the privilege of receiving the earthly Jesus, while the younger, Mary, prepares herself to receive the heavenly Christ. The busyness of Martha and the ‘not idle leisure’ of Mary are both united in Mary. While in the story Jesus credits the younger sister with have the ‘better part’, Bernard makes the point that the ‘best part’ belongs to the Virgin Mary, in whom the unity of the active and contemplative is perfected. The Virgin Mary’s ‘best’ includes both Martha’s and Mary’s parts. Francis (1182 – 1226) took the story of Martha and Mary as a model when devising his ‘Rule for Hermitages’. Each hermitage would be limited to three or four brothers, half of whom should serve as ‘mothers’ and follow Martha’s example, while the two ‘sons’ should adopt the contemplative way of Mary. From time to time these complimentary and interdependent roles should be exchanged. In the Summa Theologiae Thomas Aquinas (1225 – 1274) interprets Luke’s Bethany narrative as extolling the superiority of the contemplative life: ‘Mary has chosen the better part.’ (Luke 10:42) The active life is the servant of the contemplative. However, for Thomas and the Order of Preachers, the ‘very best part’ is not contemplation alone, but the sharing of the fruits of the contemplative life through teaching and preaching. Perhaps most important, given their geographical, chronological and religious proximity to Eckhart’s own context, are the women known by their late medieval contemporaries as mulieres sanctae, or beguines. These semi-religious women, prevalent in France and the low-countries of Northern Europe throughout the 13th and 14th centuries, lived alone or in community houses and devoted themselves to a life of prayer, service and mutual exhortation. The relationship between action and contemplation is an important theme for the beguines with the biblical sisters Martha and Mary and Leah and Rachel providing useful archetypes. Amy Hollywood has noted the contrast between the official hagiographies of these holy women and the writings of the beguine mystics themselves. The Beguine communities were quite diverse in practice and theology and in the degree to which they enjoyed the blessing of the Church. The mostly male-written hagiographies present a view of the beguine life that is reflective of the official preference for these women to favour the contemplative life of the cloisters, which was seen as more appropriate for women than mendicancy or manual labour. Needless to say, Mary of Bethany is mostly presented as the ideal. Beguine mystical writers themselves, however, such as Mechthild of Magdeburg and Marguerite Porete, tend to emphasize the Cistercian ideal of the ‘mixed life’ in which action and contemplation coalesce in the same soul. It needs to be noted that there are actually striking resonances between the Beguine mystics and Meister Eckhart, particularly in the central mystical motif of the possibility of the individual realizing ‘indistinct union’ with God within a special ‘uncreated’ part of the soul. A direct textual relationship between Eckhart’s work and Porete’s Mirror of Simple Souls has been established, and there is evidence that Eckhart also knew Mechthild’s Flowing Light of the Godhead. Eckhart’s thought comes to us primarily in two forms: treatises and biblical commentaries written in Latin for an audience of professional theologians and clergy, and sermons in the vernacular Middle High German (MHG), taken down verbatim by Eckhart’s hearers, many of them nuns and lay women. The overarching emphasis of Eckhart’s work, especially his vernacular sermons, is what the contemplative tradition refers to as unio mystica or mystical union. This is a work of pure grace in which the individual human soul realizes union with the Divine. Eckhart portrays union via several rich metaphors, the best known, perhaps, being the birth of the Word or Son of God in the soul. The aim of Eckhart’s vernacular preaching, more so perhaps than his professional academic writing, was to help his hearers toward realizing this ‘birth’ or union. I speak of the realization rather than the experience of union intentionally. Eckhart counsels his hearers to not seek an experience of God, but to seek God alone. Seekers in Eckhart’s day no less than today often expected union to be accompanied by something palpable. “I will know what it is to be in intimate union with God when I experience it – be it an inner warmth or sweetness, an ecstasy or even a vision!” But Eckhart suggests that, while some such experience might ensue, it is neither necessary nor ideal. In fact it can be a subtle trap. One can become sidetracked with experiencing the experience, mistakenly take it to be God, and in so doing miss God entirely. (PR. [German Sermon] 16b) This is why the idea of ‘realizing’ union with God better conveys the sense of Eckhart’s teaching than ‘experiencing’ union does, although he never used either term per se. The verb ‘to realize’ has two senses. To realize is both to become fully aware of something as a fact and to bring something into reality. And this is what union involves for Eckhart. Union with God is realized (brought into reality) when the individual realizes (becomes fully aware of) his or her oneness with God (as a fact). Unio mystica is, thus, a kind of knowing. If it is an experience at all it is an intellectual experience. Importantly for Eckhart, as for many other mystical writers, however, this knowing is more correctly an unknowing. It is a cultivated ‘not-knowing’ or a learned ignorance, a forgetting of what we thought we knew so that what we cannot know (in the usual sense) might be realized in us. Eckhart employs a number of metaphors to convey this ‘not-knowing’ or forgetting. Most of them involve the idea of taking something away or cutting something off. Abegescheidenheit (MHG) is one such metaphor. It is an abstract noun from a verb meaning to depart from, to separate from, and is even used to denote divorce. The most common English translation is ‘detachment’. A related metaphor is Gelazenheit, which denotes a ‘letting-go’. Often translated as ‘releasement’, Gelazenheit is a liberating relinquishment. So what does Eckhart want his hearers to relinquish? His teaching on this is summarized succinctly in the opening paragraph of Sermon 53. Here Eckhart identifies four fundamental emphases in his teaching. The first two deal with what we could call the praxis of Detachment, the second with its theoretical or onto-theological basis. This is what Eckhart refers to in the summary of his teaching we quoted a moment ago as ‘the purity of the divine nature’. God is pure nothing. To imagine God as anything is to have an ‘imagined’ God, and not God as he is in himself. To realize union is to realize the no-thingness of God as fact and to have God ‘naked and bare’, as he is in himself. The other thing Eckhart tells us he is ‘accustomed to speaking about’ when he preaches is the ‘great nobility with which God has endowed the soul.’ And we will touch on this briefly before turning to our discussion of Mary and Martha. Eckhart’s understanding of the soul, like that of Thomas Aquinas, is based on Aristotle for whom the soul of any living thing is a unified system of abilities or ‘powers’ that enable the organism, be it plant, animal or human, to express its essence or nature. The essence of human being is intellect. The ‘powers’ of the human soul are thus a system of intellectual and cognitive capacities such as sense perception, rational thinking, memory, imagination, etc. These powers connect the human via the body to the external world or ‘creatures’. For Eckhart the soul has another ‘power’. He calls it different things in different contexts – the spark, the summit, the apex, the citadel, and the ‘ground’. But these terms always denote the same thing, the inner sanctum or hidden depth of the soul. The soul’s ‘ground’ is that deep, silent and formless abyss where no sense perception, ‘image’ or thought form has ever penetrated. It is pure, untouched and virginal intellect or what we could call ‘pure formless awareness’. Through the process of ‘unknowing’ or ‘detachment’ one breaks through to this inner ‘ground.’ The truly detached person is one who has come to live habitually from this ‘ground’. We often read in Eckhart the arresting phrase, ‘God’s ground is my ground and my ground is God’s ground’. This phrase intentionally, if provocatively, blurs the line between the human and divine. Eckhart, like Marguerite Porete before him, speaks of this part of the human soul as if it were itself divine when he suggests it is ‘uncreated’. (Incidentally, this is one of the ideas that saw Porete burned at the stake in 1310 and Eckhart tried for heresy almost three decades later). This uncreated divine-human ‘ground’ is the ‘inner world’ into which God eternally sends his Son so that the Son might be continually born in humanity in time. Here all distinction falls away and the soul realizes her union with God and is enabled to live, as does God, from the ground and ‘without Why’. To live ‘without Why’ is to be as free of wanting or desiring anything as I was before I existed. I do what I do, not for any reason or objective, but simply because it is what I do. For when I live from the ground whatever I do is really God doing what God does. This is why I don’t need to do anything special to realize union. For the detached person everything is God. God is as much in my preparing a meal or scrubbing the pots as he is in my contemplative practice. The very highest contemplation is when I do what I do, whatever it may be, without Why. Then contemplation and action are unified. And this is why, for Eckhart, Martha rather than Mary is the exemplar of a person living ‘from the ground’, living ‘from her own’ and ‘without Why’. The great majority of Eckhart’s vernacular sermons take a scripture text as their starting point. Most often the text is drawn from the lectionary of the day, as with any Eucharistic homily. Sermons 2 and 86 both take Luke 10:38 as their text. On the surface these sermons, no doubt preached at different times, treat the text quite differently. In Sermon 86 we get Eckhart’s allegorical reading of Martha and Mary. Although his interpretation is creative it does at least deal with the narrative. Sermon 2 appears to not be about the story of Martha and Mary at all. The sisters are never mentioned. Nevertheless the two sermons share much theologically and inform each other significantly, as we shall see. ‘I have first quoted this saying in Latin; it is written in the Gospel, and in German it means, “Our Lord Jesus Christ went up into a citadel and was received by a virgin who was a wife.”’ Thus begins German Sermon 2. As it turns out the ‘virgin who is a wife’ is the primary interest of the sermon. The ‘citadel’ also comes up again, but does not return until near the end of the sermon. And while ‘citadel’ is probably an allowable translation of the Latin castellum – the semantic relationship is evident even to those not skilled in Latin – there is no ‘virgin’ in the Latin (or Greek) text at all. But that technicality does not hinder Eckhart. He immediately warns his hearers to ‘mark this word carefully’ – for it is going to be the starting point of the homily – and begins with a clarifying definition. A ‘virgin’, by which Eckhart means ‘the person by whom Jesus is received,’ is ‘a person who is void of alien images, as empty as he was when he did not exist.’ Let us briefly unpack this idea. We spoke earlier of Eckhart’s notion of mystical union resulting in the ‘birth’ of the Word or Son of God in the soul. For this birth to occur one must first ‘receive Jesus’ – the Son, the eternal Word – in the soul. Being virginal or ‘void of alien images’ and ‘as empty as he was when he did not exist’ describes the person who has happily relinquished ‘self and all things’ – all mental images and the distinctions they entail – and is united with God in the ‘ground’ of the soul. ‘Virgin’ describes the intellectual purity or emptiness required for the Son of God to be received in the soul. Virginity is pure receptivity. In simple terms, this is the mental stillness and silence that Eckhart elsewhere calls ‘inwardness’ and which we would call ‘contemplation’. To the ‘virginity’ of pure contemplation, which is ‘good’, one must add the ‘perfect fruitfulness of a wife’, which is ‘better’. Without this one’s virginity is ‘useless’: the gift of the Father perishes and ‘all comes to naught’. The ‘fruitfulness of a wife’ is a metaphor for giving birth, wherein that which is ‘received’ from the Father as pure gift is given back to the Father in gratitude. By ‘wife’, then, Eckhart really means ‘mother’. And herein lies the mind-melting paradox: the impossible both-and of the virgin who both gives birth and remains a virgin. Although the allusion is obvious, and intentional, this is not a literal reference to the historic Mary, Jesus’ virgin mother, any more than Eckhart’s notion of the birth of the Son of God in the soul is a literal reference to the birth of the historical Jesus. Mary, the virgin-mother, is now an archetype for the realized human being in whom two apparent opposites – virginal receptivity and motherly fruitfulness – are unified. This is a conceptual structure we often see in Eckhart’s mysticism, which modern commentators like to describe as ‘dialectical’. Dialectic is the dynamic interplay between logical opposites. The 18th century German Idealist G. W. F. Hegel constructed a whole theory of progress in history around the notion of the dialectic in which there is a threefold movement beginning with an established fact or Thesis that in time is challenged by its Antithesis. Finally this standoff or diastasis is resolved in a Synthesis, which then becomes the new Thesis. If we speak of the interplay of opposites in Eckhart’s thought as dialectical we need to be clear that it is altogether different from the Hegelian model. Eckhart’s dialectic does not serve purposive progress at all. In the purposive linear logic of history and biology virginity and motherhood are mutually exclusive. Motherhood supersedes maidenhood on the timeline. But Eckhart’s dialectic is non-linear. The interplay between virginal receptivity and motherly fruitfulness is circular, continuous and repetitive rather than linear and sequential. The opposites are engaged in a both-and rather than an either-or movement. The person who lives thus from ‘the most noble ground’ is free from the purposive linear logic that sequentializes, divides and compartmentalizes, that distinguishes ‘this’ from ‘that’ and ‘now’ from ‘then’. Such a person ‘dwells in one light with God, having no suffering and no sequence of time, but one equal eternity… he dwells in the Now, ever new and without intermission.’ Wherever, with whom ever, and whatever they find themselves doing they are waiting on God ‘in the here and now’. As I suggested earlier, Sermons 2 and 86 not only share the same biblical text in Luke 10:38, they focus on the same theology. What is portrayed abstractly in Sermon 2 becomes the subtext for the reworking of a familiar narrative in Sermon 86 wherein ‘the virgin who is a wife’ and waits on God in the eternal Now is personified in the character of Martha. Although, as I showed in the survey of the story’s treatment in the tradition, Eckhart’s elevation of Martha over Mary as the ideal of spiritual maturity is perhaps not as original as some commentators have suggested it is nonetheless given its most subversive rendering in this sermon. Sermon 86 is not an easy read, mainly because Eckhart seems to go off on tangents from time to time, and this can be a little distracting. The sermon begins with a précis of the narrative. The Lord visits a little town and is received by a woman named Martha who moves about and waits on him while her sister, Mary, sits at his feet and listens to his words. Eckhart then proceeds to list three qualities in each sister that motivate their quite different responses. (1) Mary’s soul was possessed by the goodness of God, (2) she was gripped by ‘unspeakable longing’ for something she did not yet understand, and (3) she found ‘sweet solace and joy’ in Christ’s presence. Martha’s actions were due largely to her mature age and that she had learned from life, which ‘gives the finest understanding’. (1) ‘The ground of her being was so fully trained that she thought none could do the work as well as she’, (2) she had the wisdom to know how to perform outward works ‘perfectly as love ordains’, and (3) she recognized the ‘great dignity’ of her guest. Eckhart’s first ‘digression’ contrasts two ways in which God satisfies human beings: sense satisfaction and intellectual satisfaction. Clearly, both are divinely given but they are not of equal value. Overindulgence in sensual pleasures such as ‘comfort, joy and contentment’ is not found among God’s ‘true friends’. They have the capacity to ‘rise resolutely above’ emotional responses to the ups and downs of life. So what of Martha? According to Eckhart, the fact that Christ names Martha twice in his response to her is significant. ‘Martha, Martha’ expresses the elder sister’s spiritual completeness. The first ‘Martha’ reflects her ‘perfection in temporal works’ by which Eckhart means embodied activity in time. The second ‘Martha’ refers to her relationship to eternity, which, as we saw in Sermon 2, is about the ‘equal eternal Now’ rather than everlasting sequential time. Martha lives comfortably in two worlds. Happy to do whatever the moment calls for in time she is equally at home on what Eckhart calls ‘the circle of eternity’. The first way is ‘to seek God in all creatures with manifold activity and ardent longing.’ The second way is ‘a wayless way, free and yet bound, raised, rapt away well nigh past self and all things, without will and without images, even though not yet in essential being.’ The third way ‘is called a way, but is really being at home, that is: seeing God without means in His own being.’ These three ways have the feeling of ‘good’, ‘better’ and ‘best’ about them. They are all ways into God exemplified by worthy biblical characters – David, Peter and Paul, and Christ himself, respectively – but it is clearly the third way that Eckhart is putting forward as the ultimate and, presumably, as Martha’s way. There are two important things to note about the third way. Firstly, this way is characterized by an absence of ‘means’. ‘Creatures’, which are all ‘means’, circle ‘outside of this way’. If there are no ‘means’ here then everything must be equally an end in itself without any ‘in order that’, purpose, or meaning outside itself. Actions, works, activities are also ‘without Why’. Secondly, although Eckhart has called it a ‘way’, this is not entirely accurate, for a ‘way’ presupposes a destination, that there is some place to get. That is why he corrects himself by saying ‘really it is being at home.’ There is an already-arrived-ness about this ‘way’ which is why it involves no means. Friends of God like Martha have nowhere to get and need no means of getting there because they are already there. Although living in time, embodied and active they are also standing on the circle of eternity and ‘seeing God without means in His own being’. Where, then, is this circle of eternity and where is the God they see in his own being? All Eckhart quotes are from Maurice O’C Walshe’s translation in The Complete Mystical Works of Meister Eckhart (New York: Crossroad Herder, 2009). I have followed the accepted convention of referring to Eckhart’s German Sermons by the numbering used in the critical German edition of his works. This consists of the abbreviation Pr. (From the German word for ‘sermon’, Predigt), and the sermon number.